While Korea is an ancient kingdom, known by different names through the millenia, the Joseon dynasty, or Yi, have only recently established their auspicious rule. Through many turbulent eras, the Korean people have prospered, securely controlling their peninsula and the waters that surround it and claiming much of the land beyond the northern mountains at times now long past. To their west, the sprawling Chinese Empire has always played a role of central significance in Korean politics, and the Koreans have gained much from trade and collaboration with the Chinese including the gradual adoption of Confucian wisdom into its administration and traditions. Unfortunately, the past two centuries have seen the Chinese dominated by the barbaric Yuan of the Mongols and the Korean kingdom's relationship with this threatening power has sadly been one of tribute and coercion. Eastward, the Japanese, ruled by their emperor in name but divided into powerful clans, have played both friendly partners and antagonistic rivals in the histories of the kingdom. To the north lie the rugged lands of the Jurchen tribes, militaristic societies with inferior culture that frequently threaten to encroach upon the Korean realm. Recently the politics of China have given rise to Korea's most recent and most drastic upheaval in many centuries. Crushing their Mongol overlords, the Ming dynasty has established itself and reasserted Chinese rule of the Mandate of Heaven. The aristocrats and scholars of Korea have been divided over supporting the two vying factions. With rebellions left uncontrolled by the Ming spilling across the Korean borders, King U ordered the Korean army to attack the Chinese and seize Liaoning province in the chaos. General Yi Seong-gye, a supporter of the Ming backed by aristocrats and commoners alike, rebelled against his orders to attack the nascent Ming dynasty and turned his army against his king. After securing control of the government, Yi Seong-gye ruled through King U's successors for many years before finally announcing the end of the Goryeo dynasty and the creation of the Joseon dynasty, crowning himself king. Though he enjoyed powerful support within the kingdom's administrative institutions, the new king was aware of how little legitimacy his reign could cite if pressed. Seong-gye therefore sought strong ties to the Ming dynasty, whom he believed shared many common enemies and ambitions with his own kingdom, in order to bolster his own mandate with the approval of the imperial Mandate of Heaven. He agreed to submit to the imperial tributary system as the first and foremost among the Ming's many supplicants, securing their powerful support for his rule and their protection against foreign parties that might attempt to take advantage of division within his realm. Under Seong-gye and his successors, Korea found itself reinvigorated and prosperous. The rule of the Goryeo had become aloof, stagnant, and decadent, but the Joseon would not similarly take their position for granted. They created an enlightened administration, merit-based in the Chinese style, and reinforced the use of Confucian philosophy throughout Korean culture. Yi Do, destined to be known as Sejong the Great, now rules the kingdom and his rule has continued to reshape the Korean people at an unprecedented rate. He has won great victories against Korea's bellicose Manchu and Japanese neighbors and has drafted plans to expand his rule to include these unenlightened cultures. Breaking with traditional views regarding changing technology and new ideas, Do looks beyond China for opportunities to change the balance of power within the region and attracts innovative minds to his capital of Hanseong. A renaissance king of an Asian cast, King Do is well prepared for the oncoming age of discovery. Founded as both a body of council and an institute for research regarding academics and national policy, the Hall of Worthies brought together many of the nation's great Confucian scholars as a resource to be ready and at hand for Korea's king. At its founding, King Do prioritized the creation of methods for disseminating Confucian ideals into common Korean culture, and a script designed specifically for the Korean language that would allow literacy among the lower classes. ​The Goryeo dynasty, claiming descent from the Goguryeo kingdom, had long wished to extend their rule over the Jurchens of Manju by right of this ancient heritage. It was these aims that had led the last Goryeo king to order the invasion that provoked Do's grandfather's rebellion and led to the installation of the Yi upon the throne. Times had since changed, and the Ming control of China had become secure while the threat of a resurgent Mongol empire seemed long past. King Do distrusted the neighboring Jurchens, now fellow tributaries of the Ming, and disliked their control over the mountains and highlands northwest of the Yalu and Tumen. 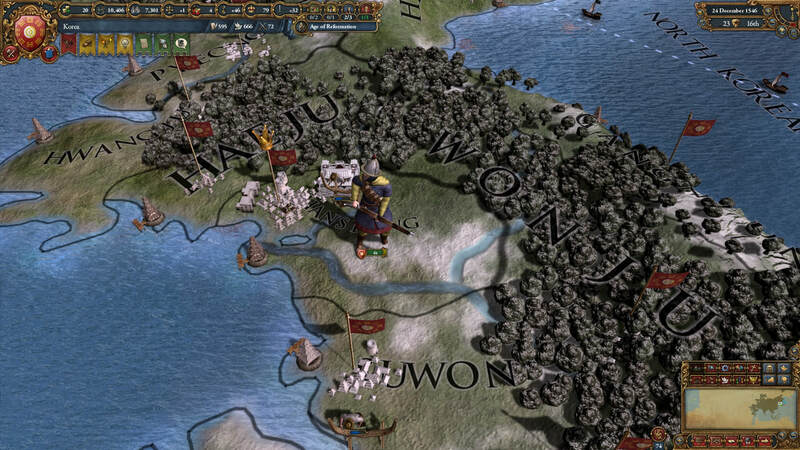 Citing the need to control the rugged defense frontier of Korea, King Do conducted a series of wars against the tribe of Jianzhou, successfully securing the valuable iron mines of Buyeo and the strategically vital highlands of Ryeongwon, which were promptly fortified. The fortress system of Ryeongwon would now serve as the linchpin of the peninsula's defense in all of Korea's conflicts with their aggressive inland neighbors. 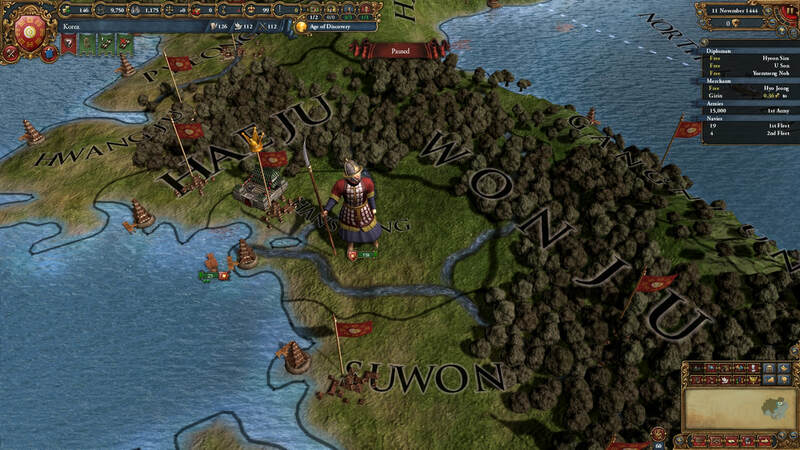 A decade later, King Do's commanders brought Korean rule to Geonju itself, the homeland of the Jianzhou tribe, ending their independence and leaving a significant Manchu population within Korean borders. Despite their familiarity with Confucian traditions, the Manchu culture was difficult to integrate into the Korean kingdom. Shortly after their annexation, many of the clans of the Jianzhou tribe organized a mass rebellion along the recently annexed borderlands. As subjugating the rebels proved costly to the manpower and treasury of the kingdom, King Do and his Hall of Worthies focused on how to improve the kingdom's administration in response to such an expansion. Firstly, efforts were made to raise the status of Manchu subjects by removing all restrictions on their movement and social rights within the kingdom and by appointing Manchu to public offices and high rank within the Korean military. Secondly, the Sinmun Office was established to address cases brought before the government in Hanseong regarding unfair laws or the mistreatment of subjects by government officials. King Do had watched the rise of the Ming, and his grandfather had refused to attack them when they were vulnerable. King Taejo had quickly accepted Korea's place within the Chinese tributary system in order to solidify the legitimacy of his new dynasty, but King Do had come to loath the annual ceremonies and supplication. China was the home of Confucianism and much of Korea's traditions, but King Do harbored doubts that his brave and innovative people owed allegiance to the Chinese as a matter of course. Recognizing that the Ming were growing ever more powerful throughout the course of his reign, King Do took steps to challenge them when they attempted to subjugate the vast Mongol realm of the Oirat. After sending his diplomats across the steppe to solidify an unlikely alliance with the Oirat Khan, the armies of Korea besieged the Ming garrison of Simyang, aware that the Ming forces were far off fighting the Oirat hordes. After Simyang's fall, the Korean commanders defeated a Ming army in Yongping before surrounding their capital at Beijing which soon fell as well. With their emperor in exile from his capital, the Ming accepted the refusal of both Oirat and Korean tribute for the time being and ceded the border province of Andong to King Do. The Manchu people of the rugged lands of Ningguta were wealthy and industrious and many of their clans now thrived under Korean rule, but with the fall of Jianzhou the northern range of Ningguta had fallen under the expanding control of the barbaric Yeren tribe. Deciding that all the Manchu of Ningguta would better prosper within the Korean kingdom, King Uichang organized a simultaneous assault on the dangerous Yeren with other major tribes of the steppe that the Yeren similarly threatened. Unsuited for combat in the region's rugged terrain, the warriors of the Yeren were unable to displace the Korean soldiers that occupied Ningguta and the villages as far north as the Amur river fell under Korean rule. Beginning under the reign of King Do, Hanseong saw investment on an unprecedented scale, including the construction of public structures and spaces, expansion of the port, and the attraction of talented artisans and artists from across the kingdom and beyond from Ming China and Ashikaga Japan. During the reign of Do's son, Uichang, the profits of these continued policies were apparent and the city found itself at the center of a Confucian renaissance in art, science, and philosophy. The Hall of Worthies had completed the Hangul Alphabet, much of it personally designed by the late King Do, and this contributed to an explosion in Korean literature that soon inspired literary responses from the Chinese and Japanese. A new view regarding everything from sculpture to farming methods to political policy was quickly being accepted by the populace of East Asia. Further conflict with the Yeren was initiated by King Uichang for control of the Far northern island of Sakhalin. The thriving Asian renaissance inspired Uichang to expand Korean enlightenment across the seas, and with his patronage Korean explorers were striving to explore far afield of the traditional Korean trade routes. Aiming to secure safe harbor for Korean sailors venturing northward, Uichang once again sent his soldiers into Yeren lands. The undisciplined and weakened horde of the Yeren failed to resist the Korean army and Uichang was not only able to secure Sakhalin, with its sparse Ainu population, but also the wealthy harbors and Manchu villages of Deren. Taking a page from the history of his grandfather, King Tae aimed to further weaken the Ming threat to Korean independence by coordinating with the Mongols of the Oirat. When the Ming were engaged in a war with the emergent Shan kingdom, far to the southwest, King Tae took the opportunity to send his armies against Beijing, confident in the knowledge that the vast majority of Ming forces were many months travel away and already actively engaged in war. Before Ming armies were mobilized to resist the Korean army in the field, the castles of Simyang and Beijing were already in King Tae's hands. Tae's commanders refused to confront the unified forces of the Ming, instead drawing the Chinese armies into the Korean mountains and launching attacks on isolated commanders. Spread thin across their vast borders and facing many hostile neighbors, the Ming abandoned Simyanga and Gaizhou to the Koreans in exchange for the return of Beijing and the imperial seat. ​During King Tae's reign, power struggles and court intrigue between the Hungu and Sarim factions within the Korean government led to an unprecedented and bloody series of executions and expulsions of scholars within the political administration of Hanseong. This reclamation of administrative power by Korea's noble elites caused a significant period of stagnation for the Korean kingdom in the years after the war with the Ming dynasty. Upon his death, King Tae's had no surviving sons and his daughter was too young to govern. Tae's queen, Yi Insun, was quick to rally the court behind her in order to secure a regency for her daughter with herself as regent. She proved an able leader and political student. A second purge of advisers and administrators occurred early into the reign of Queen Jeongsin, after the young ruler was informed that the powerful Yi Insun, was in fact not her true mother. As the queen learned, Jeongsin's true mother, one of King Tae's favored concubines, had been poisoned and killed by conspirators at the behest of Regent Insun shortly after the dowager queen had come into power. This news enraged the young queen and prompted executions of all those suspected of involvement or to have been known to be especially close to the late regent. Calling upon treaties signed by her predecessors, the Haixi Jurchens pulled the Korean kingdom into their bloody conflicts with the Yeren Jurchens. With the aid of the Korean army, the Haixi were able to decisively defeat their rivals. The Manchu citizens and soldiers of the Korean kingdom's frontier provinces proved a valuable resource during the war. A relative of one of the many ministers of the Korean government in Hanseong, Heo Nanseolheon's literary brilliance brought her great fame in the court of Queen Jeongsin. The queen recognized her work as a treasure of the kingdom with a philosophy that would resonate with the noble and common classes alike, and gave the young woman the patronage of her court and ordered her work made accessible throughout her realm. Suffering under oppression from the Ming government, the nobility of Ningyuan had petitioned the Korean court for liberation from the Chinese, offering to pay homage to Hanseong if they could be freed from Beijing. Queen Jeongsin, emboldened by the performance of her army during the Jurchen Clan War, ordered her commanders to take advantage of this opportunity and march against the Ming. The Oirat hordes answered the Queen's call, and assaulted northern China while the Koreans advanced on Beijing from the east. The coming years saw much blood spilled along the Chinese defenses, but Jeongsin was disappointed to admit her armies had failed to break the Ming. With her recruiters struggling to rebuild her tattered forces, and no sign of fatigue in her enemies, the Queen cut her losses and retreated before signing a peace accord with Ming. The people of Ningyuan would remain under Chinese rule. The first official Korean colony, according to the royal office of exploration, was founded at Kelang on the northern end of Formosa. Following this initial step of Korean expansion, sailors would found a prosperous colony at Manila in the tropical Philippines archipelago, despite the harsh and alien environment the settlers would encounter there. The port they constructed at Manila would serve as a nexus for further missions among the countless southern islands. 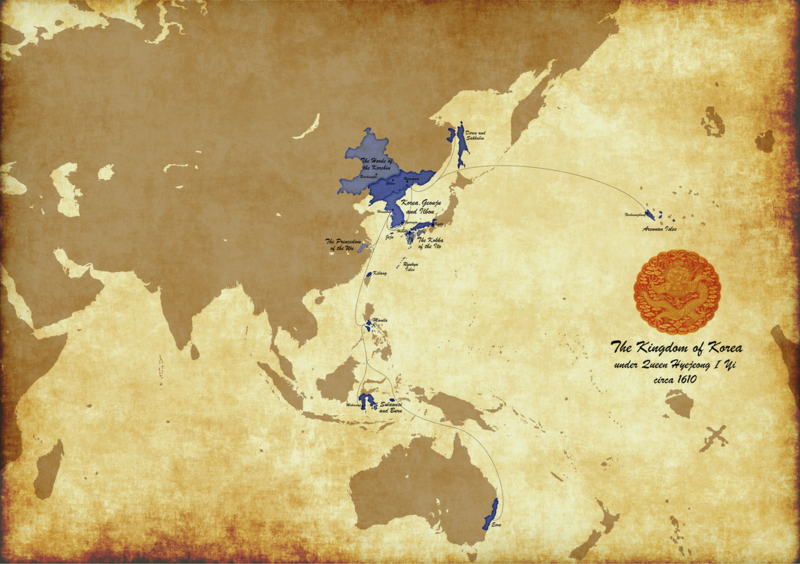 Exploring the unknown waters east of Japan, the Queen's explorers found numerous other islands with a climate hospitable to traditional Korean crops and only sparsely populated by a strange a backwards tribe of barbarians. From the language of these primitives, these isolated lands became known as the Drit Islands and Korean colonies were establish on the most hospitable within a decade of their discovery. Though it was originally only the name of the largest of these scattered settlements, this maritime community of colonists became known as Arenna by the larger Korean population. Aware that Korea would soon follow suit if she allowed other realms that bordered the Ming empire to be subjugated by the Chinese emperor, Queen Jeongsin chose to support the Chagatai barbarian hordes when the emperor sent his armies beyond the Great Wall and into the steppe once more. After years of fighting along the Ming borderlands, the war ended with little change among the status of its participants. Given the contribution of the Manchu people to the kingdom's prosperity, Jeongsin wished to include even the Yeren in Korea's great future rather than see them fall within the grasp of Beijing. However, the queen recognized the difficulty of controlling the nomadic Tengri people who inhabited the cold plains between the mountains of Ningguta and the coast of Deren. After defeating the remainder of their warriors, much diminished from the great hordes that fought during the Clan Wars, Queen Jeongsin ordered their warlords released once they agreed to introduce and foster the teachings of Confucius among their people, allow Confucian scholars to advise their rule, and pay an annual tribute to the Korean throne. After the Khan of the Oirat submitted to the Ming, Korea was forced to look for a new ally in their struggle for independence. Queen Jeongsin chose to support a tribe from the Mongol heartlands, led by a descendant of the great Genghis Khan, in their revolt against the Oirat in hope that this upstart warlord might prove more successful at resisting Chinese dominance once in power. While the young warlord was victorious in establishing his hegemony over Mongolia, Jeongsin feared his horde's independence would not last long. ​Politics in Japan had led to the rapid consolidation of power under the Ashikaga shogunate, and Queen Jeongsin distrusted the ambitions of a unified Japanese state. Korean kings of the past had frequently sought to subdue Japanese piracy through control of Tsushima island, and though this had met with limited success for her predecessors, Jeongsin trusted her fleet to triumph where others had failed. The Korean navy transported most of the queen's army within the territory of the Hosokawa clan on Kyushu before their call to arms brought the assistance of the Ashikaga fleet. The opposing fleets clashed repeatedly in the Sea of Japan, but the Ashikaga admiral was unable to prevent further Korean landfalls and Japanese blockades of the Korean coastline were unable to be maintained. During the war, Korean engineers developed geobukseon, or turtle ships that Ashikaga found extremely difficult to defeat and sink in battle and as the war continued the Ashikaga fleet began to find itself confined to their ports. Similarly bloody confrontation was occurring on the Japanese islands, with the Korean forces facing a united army of Japan's most powerful clans. While costly in Korean lives, Queen Jeongsin's commanders used the terrain to deliver victory after victory on the battlefield. The Shogun was forced to abandon all of Kyushu except the port of Bungo to the Koreans. Recognizing the difficulties of establishing official Korean rule, Queen Jeongsin raised up one of the native daimyo that had long been out of the Shogun's favor to rule most of the island in vassalage, although Chikuzen and its prosperous markets would be directly controlled by the Korean merchant guilds. The Ito clan, defeated and disgraced by their rivals in the previous wars that raged across Japan, found a new resurgence in fealty to the Korean throne, while the Hosokawa, once rivaling the Ashikaga in power, were left in such disarray that their clan was forced into complete submission by the shogunate. Following the momentum of the initial invasion, the Korean commanders crossed the Kanmon Straits again a decade later. 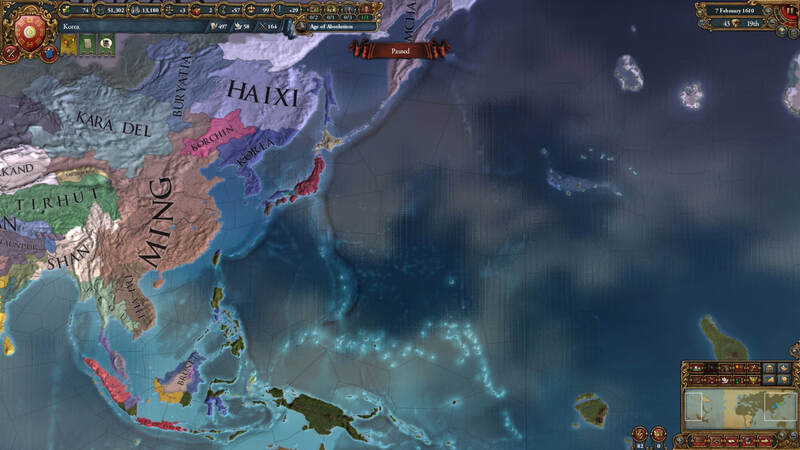 With their navy securely in control of the surrounding seas, the Korean commanders were able to dictate the war on their terms and soundly push the Ashikaga army back to Kyoto. Unfortunately, the Ming emperor chose this moment to bring their might to bare against the Kingdom of Korea, aware that the Korean army was unprepared to fight in a western war. Forced to abandon grander designs, Queen Jeongsin ordered the gold mines of Iwami and the surrounding fortified provinces seized from the defeated shogun and a hasty truce agreed upon. Her long reign had been defined by her constant struggle with the domineering power of the Dragon Throne, but it would end with a period of humble subjugation. The armies of Korea inflicted massive casualties upon the Chinese forces that invaded the Korean and Manju highlands, but the resources and manpower of the Ming, concentrated on subjugating the Korean peninsula, appeared to be inexhaustible. After initial losses against the Ming navy, a brilliant young admiral from the royal family, Yi Sun-sin, was given command of the Korean fleet. Though his ships were outnumbered, Sun-sin delivered a series of victories that wrested control of the coastline from the enemy and allowed Beijing to be blockaded. 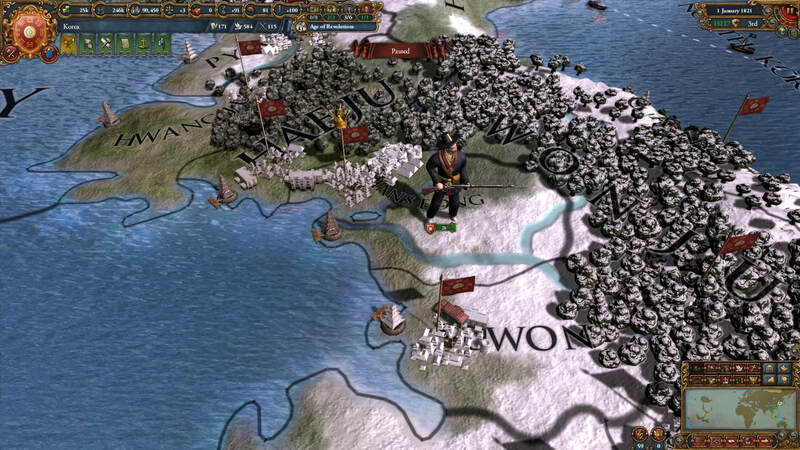 However, control of the seas could not stop the march of the Ming army, and stronghold after stronghold slowly fell to the relentless assault on Korea's fortified border. Before the Ming could bring open warfare to the populace farmlands in the south, Queen Jeongsin humbly requested to reinstate the Korean tribute to the emperor of China, in exchange for the withdrawal of his soldiers. Though the spherical nature of the Earth was well known to Korean scholars, this knowledge did little to dampen the sensational discovery of seafarers from the Far West off the coast of the newly discovered continents east of the Drit Islands. Within a few years, the French had established multiple colonies at alarming speed among the isles, encroaching upon the islands of Arenna. The Queen's advisers insisted that the value of the newly discovered lands overseas had been underestimated and the Korean people now risked losing out on unimaginable unclaimed wealth from abroad if steps were not taken to boost Korean influence abroad. In response, Queen Jeongsin established the Hwanju Company to officiate the development of the kingdom's colonial efforts and to learn from the pioneering techniques of the French and Portuguese settlers that were commonly being encountered overseas. Jeongsin's son and successor, Yi Yeong, continued his mother's efforts to dismantle the Ashikaga Shogunate, pursing total war across the islands of Japan. King Yeong extended the Korean domains in Japan, won the loyalty of further daimyo opposed to the Ashikaga, and took great efforts to include Japanese and Shinto culture into the traditions and culture of the kingdom at the expense of the loyalty of the most conservative Korean factions. Most powerful among his new allies were the Shiba, who ruled Kyoto in the name of King Yeong after the illustrious city was captured. The Ashikaga, growing ever weaker and more isolated, were forced to retreat to their northern strongholds. 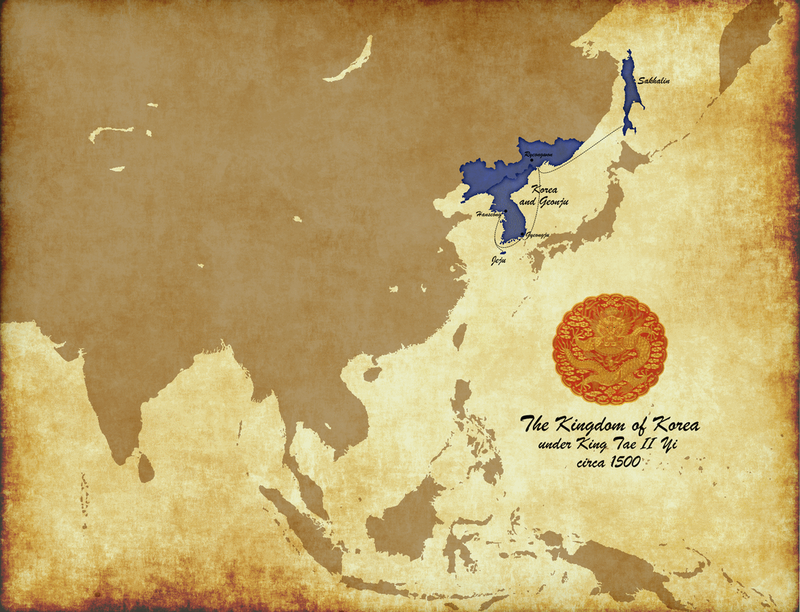 Their defeat at the hands of the Ming had made clear the need for Korea to expand its control further outside of the peninsula. The Haixi Jurchens were a belligerent thorn in the kingdom's side, and King Yeong sought to end the rule of their khan and bring his people to heel. Constantly feuding among each other, Yeong had no trouble finding allies among the steppe tribes that were interested in attacking the Haixi khan. After crushing the Jurchen warriors on the battlefield, Yeong's commanders enlisted the aid of the Korchin tribes that had been subjugated by the Haixi in the past. With no desire to personally police the barbaric steppe lands of Mongolia, Yeong entrusted the Korchin warlords to rule these frontiers in his name. The Haixi clans fled from Gillim and withdrew to the harsh northern reaches of Manju. Korea had long standing relationships with the small island kingdom of Ryukyu regarding trade and military support, but as the Koreans had expanded their reach, their partnership's pretense of equality between the kingdoms had grown nonsensical. Despite the resistance of their king to any peaceful means of incorporating his realm into the growing Korean kingdom, the independence of Ryukyu within the middle of the Korean sea routes was a threat that King Yeong saw no reason to tolerate. Ordered to annex the island kingdom, the Daimyo of the Ito forcibly dethroned the king of Ryukyu with as little bloodshed as possible. The colonization of Kendari had brought the Koreans into close contact with the hostile inhabitants of Buton. A short campaign against these islanders removed their political leadership and placed their villages under the governance of the colonists, but the native people would remain unruly for many years to come. No further organized resistance was met by the Korean settlers as they extended their reach over the fertile lands of Sulawesi and nearby Buru. The colony of Makassar, founded shortly after would quickly become a hub of Korean shipping throughout the region. By withholding Korean tribute and barring imperial emissaries, Queen Hyejeong provoked Ming hostility and sabotaged the relationship that had been reestablished between the two nations at the end of her grandmother's reign. This change in policy had origins in the growing regional influence of another empire, that of the Russians. Hyejeong's diplomats had sought out this new power in hopes of turning their focus towards China and received warm welcome at their court in Moscow. When the Ming sent their soldiers to reopen the Korean borders, the Russian emperor responded to Queen Hyejeong's call for assistance. The Korean commanders ambushed and defeated the Ming armies that besieged the fortifications of Geonju, but the Queen was aware that it would take many more victories to humble the Ming emperor. The Korean fleet, much improved over the past decades, confronted the Ming armada at the Battle of the Bohai Sea and handily smashed the more numerous enemy, granting control of the seas to Hyejeong's admirals. Russian armies clashed with the Chinese in Mongolia, keeping them engaged and unable to respond to Korean advances on Beijing. Within the year, Korean soldiers once again sacked the imperial capital city and the distraught emperor admitted defeat. In addition to Korean independence, Queen Hyejeong demanded control of the coastal city of Hangzhou, a key nexus for shipping in the South China Sea and surrounded by rich farmland. The enlightened queen conscripted the local Wu nobility to rule in her name in hopes to quell any unrest that would undoubtedly arise from foreign occupation, and to burgeon local support for Korean influence. The inefficiency and corruption engendered by the traditional tax institution of the Korean kingdom had become more evident as the kingdom's reach had expanded and exposure to foreign administrations had increased. Chief State Councilor Yi Won-ik dedicated much of his career to reform the kingdom's tax law, and introduced the Uniform Land Tax. To the dismay of the clergy and nobility, this change redirected much of the tax burden onto wealthy land owners and resulted in increased productivity from the relieved peasant class. The provinces of Sangju and Pyongan notably saw record tax surpluses the year following the reform and these improvements proved sustainable, with increased returns year after year. Hyesun's reign had a rough beginning, ascending the throne as a small child when her father, Se, died young. Initially Hyesun was guided by her mother, the Queen-Regent Jeongmyeong, but her mother soon followed her father into grave, a possible victim of ruthless court intrigue. A council of nobility and Confucian scholars assumed control of most state affairs until Hyesun reached majority and asserted her personal sovereignty. The regency council was forced to act against European incursions into Indonesia when the friendly kingdom of Brunei came under invasion from Spanish colonists. The armies of Brunei were hopelessly outmatched by the Spanish and their Portuguese allies, but Korean soldiers soon landed on their island to assist them. Though the Europeans had vast resources to call upon, their armies were far from home and the Korean commanders were fortunate to be able to engage them piecemeal. After four years of conflict in the island's jungles, the Spanish finally tired of being denied access to their settlements. The king of Brunei agreed to peace with his aggressors and reclaimed some small area of the island from the Spanish in the negotiations. Two decades later, this conflict would reignite and the Korean commanders would take advantage of their growing experience with their European enemies. A stronger navy, more dependent on large galleons than coastal ships, was able to compete with Spanish control of the seas and the Korean army moved quickly between Indonesia and the New World to confront the Spanish wherever they mobilized. The Brunei Wars taught Queen Hyesun early on that significant effort must be devoted to challenging the European presence overseas if the Korean kingdom hoped to develop any influence in these regions. While the European advance had been stalled in Indonesia and Malaysia, Queen Hyesun turned her attention to the New World. The primitive tribes that the Korean explorers had encountered on these newly discovered continents would pose no obstacle to the Europeans, the queen knew, and if she would not have them become European colonies, Korea would need to quickly stake its claim. 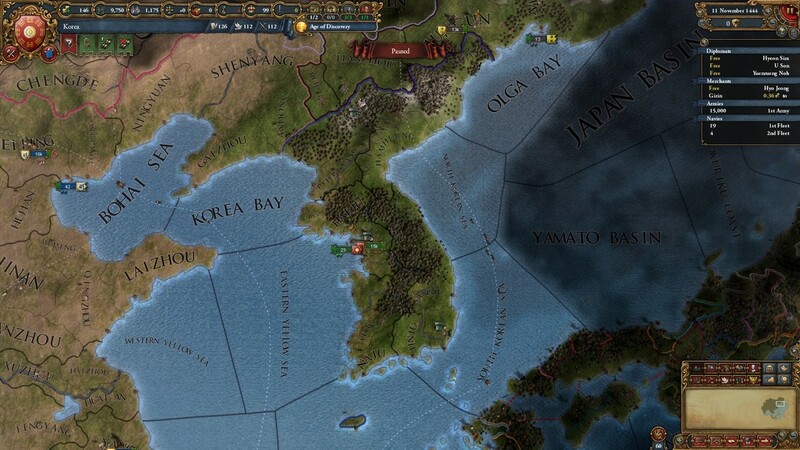 At her admirals' suggestion, Hyesun chose the river delta of Di'yaa for Korean settlement, starting on the sparsely inhabited islands that peppered the nearby bay and then launching a campaign of subjugation and removal against the denser native populations around the river. The fractious nature of the local tribes prevented any meaningful organized resistance and brought many tribes under Korean influence without bloodshed. Within a few years Korean colonies soon dominated the bay area, unified by the colonial government of Njusore. The trade port at Makassar had been the center of Indonesian trade for Korean merchants for forty years, but it had always been rivaled by the port of Kalapa in the kingdom of Majapahit. When Queen Hyesun's council learned that Majapahit's ruler had allied himself with the Portuguese, they insisted that she move against him. The resulting offensive brought the rival port under Korean rule, solidifying their merchants' control over all Indonesian trade and providing Korean forces a secure foothold on the island of Java. 15 years later, Hyesun would exploit this advantage to claim more of Java and secure the fortress of Perak from the allies of Majapahit in Malacca. Recognizing the challenges that would arise from ruling a significant population of Hindu subjects, Queen Hyesun bent her scholars to the task of harmonizing the Hindu traditions with Korea's sacred Confucian ideals. The power struggle between Hanseong and Beijing would erupt once again during Queen Hyesun's reign. The new Ming emperor wrongly assumed Hyesun would prove weaker than her grandmother and sought to place Korea once again under the yoke of the Celestial Empire, but Hyesun had maintained the friendly relationships between that had proven valuable in the past. With the Ming armies split to confront Korean armies in the east, Russian armies in the north, and Vietnamese armies from the south, the Celestial Emperor suffered an embarrassing defeat on both land and sea. Although it was impossible for Hyesun to destroy the Ming hold over East Asia, she took this opportunity to expand the Wu control over the provinces surrounding Hangzhou. To the annoyance of the Ming, the Wu were once again a significant political force directly challenging their Mandate of Heaven under the protection of Korea. The kingdom of Dai Viet had fought alongside Queen Hysesun against Ming supremacy and had suffered just as much bloodshed at the hands of the Chinese armies. When her recovering allies came under attack from their opportunistic neighbors, sycophantic tributaries of the Ming, the queen did not hesitate to send her commanders to assist in Dai Viet's defense. Together, the alliance was able to drive the armies of Pegu out of Vietnam and go on the offensive. Dai Viet annexed much of the contested jungle interior, with the king of Pegu in no position to resist. The weak grip of the Portuguese military on their island possessions in South Asia had been revealed during the Brunei Wars, and Queen Hyesun choose to capitalize on this when affairs in Europe had driven a wedge between Portugal and its traditional Spanish allies. Unable to mobilize a significant military effort in Indonesia, the Portuguese king ceded its settlements in Sumba and Timor to the Korean kingdom after a few years of hostile occupation. Ilbon, also known as Japan, was split in two, with the provinces south of Kyoto held by Korea and the provinces to the north held by the Ashikaga. In order to assert Korean hegemony over the Japanese, Queen Hyesun would allow Ashikaga rule but demanded tribute and recognition of her authority over the island. Unwilling to bend, the daimyo of the Ashikaga refused to accept subordinate status and Queen Hyesun chose to pursue her goal through force where diplomacy had failed. The Ashikaga could not defeat the concentrated might of the Korean army and were forced to submit or face destruction, but in little more than a decade the truculent Japanese closed their borders once again and the relationship quickly broke down. Though Queen Hyesun's reign had been long, her designated heir at the time of her death was quite young and had not finished his education. Her husband, Pak Hyeon, would lead his son's regency council until he was ready for his throne, greatly increasing the influence of the Pak in Hanseong. A strong believer in his late wife's dream of Korean primacy over Asia, Hyeon would pull the kingdom into a war that would finally prove that Korea could match the might of the Chinese. As the Ming was engaged in recurring warfare with the kingdom of Shan and their Spanish allies were deeply in debt from wars with the Ottoman Empire, Pak Hyeon ordered Korea's armies into Hebei once more. Beijing fell and Korea's coordinated forces destroyed the first Ming levies sent against it. With assistance from the ambitious Wu prince and Ito soldiers, most of the prosperous Chinese coastline was occupied within the next year. However, the Ming broke off their campaign against Shan to concentrate on the Ming invasion, and soon the Korean army was facing an earnest counter-attack. Hyeon's commanders assured him that the war would only get harder as it progressed from this point. Though Hyeon wished to press his son's claim on the Celestial Throne itself, his survey of the situation agreed that the time had not yet come. With hegemony over the Chinese in mind, Pak Hyeon agreed to withdraw Korean forces for substantial expansion of the Wu territory over the nearby fertile farmland and prosperous markets, and for control of Hebei and the Yan Chinese. This meant that the Chinese Emperor would humiliatingly cede Beijing and the Bohai Sea to Korea, and move his seat south. Though he appointed his nephew, Pak Du, to rule over them, Hyeon immediately allowed the Yan great autonomy as a client princedom of Korea. King Yeongyang was an eager student of economics and trade, and he saw great untapped potential in the overseas influence of his kingdom. Reversing the friendly policies of his immediate predecessors towards Pasai and Brunei, Yeongyang demanded full control over the ports of these island kingdoms, but they were unwilling to hand over their financial lifelines. Confident in his vision, the king did not hesitate to use force and pursued two years of island hopping military campaigns to crush the resistance of the island kings. Soon Yeongyang's administrators and the Korean merchant guilds ruled the populous cities of Brunei and Pasai and substantial tracts of the Sumatran and Bornean coastlines. The deposed rulers and their armies were pushed inland or away from these population centers. While they surely plotted to overthrow Korean rule, the king was far more concerned with understanding the significant population of Sunni Muslims he had chosen to incorporate in his rule. Though he knew internal strife was inevitable, he directed his scholars and priests towards the question of how this faith could best serve the kingdom rather than striving to oppress it. While the Ashikaga vowed resistance to Korean rule over the Japanese, King Yeongyang had been approached by diplomats from the most powerful clan under Ashikaga rule, the Uesugi. At their behest, Yeongyang launched a crushing invasion of Ashikaga lands, delivering a humiliating defeat. The Ashikaga were forced to release all Uesugi land, and their grateful daimyo accepted the protection and supremacy of Hanseong. 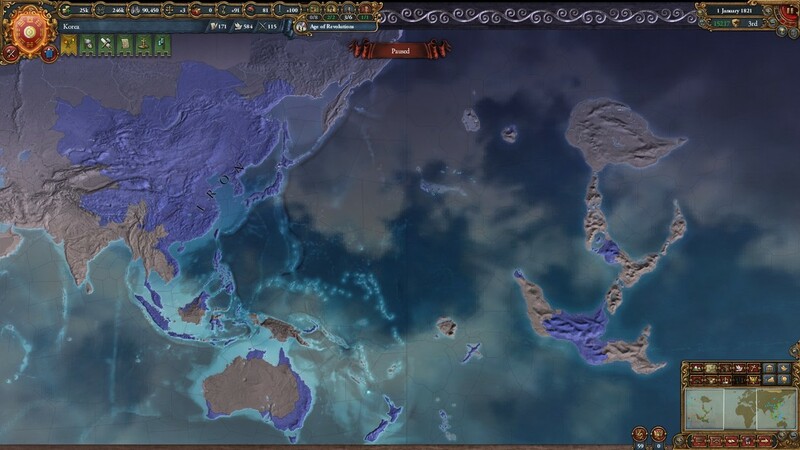 The Russian emperor called his Korean allies to war against the Celestial Throne, and Yeongyang sent his commanders to test the strength of the Ming. The Korean navy quickly smashed the Ming fleet and blockaded the Chinese coast while Korean soldiers, supported by the Yan from Beijing and the Wu from Hangzhou, secured the eastern river valleys but were hesitant to engage the enemy in the rugged inland terrain. Following only one major engagement, a decisive victory, Yeongyang decided to hold back his soldiers as he saw little gain in further taxing his strained armies and economy. The Ming appetite for war was already quashed by this point, and the Russian emperor had little difficulty in convincing the Ming to relinquish their influence over the Chagatai. Yeongyang was beginning to see the fruits of his labors. Though his commanders were hard pressed to quell the violent uprising of his new Sunni Muslim subjects, Yeongyang was well educated in his nation's political history and he was sure of the eventual enlightenment of all under the Confucian teachings. Merchants flying Korean flags brought exotic and valuable trade goods from distant Korean colonies to markets throughout his realm and brought back gold from foreign lands to the tax coffers in Hanseong. 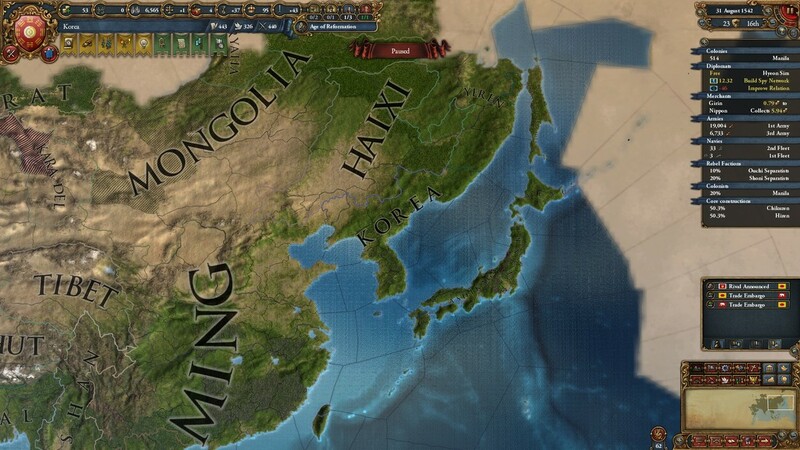 With great diplomatic effort, Yeongyang had peacefully wrested political power from the Wu prince and his court and now the Korean merchant guilds were firmly in control of Hangzhou and the Yangtze riverlands. Yeongyang's great trade reforms had restructured the Korean control of the regional markets and trade taxation around Indonesia, with its nexus in the great multicultural port of Brunei, and all of his widespread domains and colonies contributed to this new and unprecedented level control designed to limit the growing influence of European nations. His realm had bested the strongest of the European invaders, defied the will of the Ming, and Yeongyang now aimed for the Celestial Throne itself to solidify Korean supremacy. At the request of his nobles and scholars, Yeongyang reclaimed the ancient imperial titles and oversaw the official birth of the Korean Empire, consisting of the united domains of Korea, Geonju, and Ilbon, the lands of the Yan and the Wu, the diverse provinces of the countless southern islands, and the expanding colonies of the New World. Under the stewardship of the Yan, Beijing was the face of a rapidily changing society at the conflux of Korean, Manchu, and Chinese cultures. As the previous capital of the Ming empire, the Celestial Emperor's administration had cultivated the city into the undisputed nexus of the Asian markets and the origin of the modern global trade paradigm. With the retreat of the Ming and a desire to assert its new prominence, the Yanju Princedom welcomed the discontented administrators of the Celestial Empire, Korean scholars and experts, and even skilled individuals of foreign nationality to Beijing. Within a year of its new administration, this volatile combination of the region's top philosophical and scientific minds started a revolution in thought and education that would reshape Asian society and academia before spreading to the rest of the world. A newfound focus on rationalism and empiricism would lead to radical concepts regarding the rights of man and the duties of human institutions, and lead to a new common understanding of the natural environment from studies and projects based on enlightened methodologies. With strong support among the Yan and Wu, and sympathetic nobility in Shandong and among the Min, the ambitious Yeongyang was eager to press the Yi claim on the Mandate of Heaven once again. When the Ming emperor once again attempted to subjugate the powerful kingdom of Shan, the Korean armies launched their attack from Yanju. By the time the emperor disengaged his army from the jungles of the south, most of Yangtze and Yellow river basins were occupied by the Korean army. The Ming commanders suffered repeated defeats as they attempted to displace the Koreans from Xi'an and the prosperous river valleys, but the Ming mountain strongholds in Datong and Taiyuan held strong in the north and were a constant threat to Beijing and the Korean supply lines. The new seat of the Ming in Yangzhou had fallen early in the war in the latest of disgraces suffered by the Chinese emperor, and although still able to call on vast resources, the inability of the Ming to defend their control of China and its tributaries overtly displayed the fallen state of their hegemony. With the Celestial Court captive, the Ming emperor fleeing in exile, and the support of numerous Chinese factions, Emperor Yeongyang declared that the Celestial Throne would now be seated in Hanseong, and from there he would lead the Korean and Chinese people to a new and glorious order. Furthering his ambitions, his defeated rival agreed to cede Shandong and all the Chinese lands between there and the Wu to Korea and its Yan vassals in exchange for peace. Having witnessed the fate of those who claim the imperial title but fail to enforce their mandate, Yeongyang sailed his armies to Kyoto to finally end Ashikaga pretensions. The defiant warlords of the clan were forced into negotiations once more, where the Ashikaga and their Ainu allies pledged to submit to the Korean throne, but only after their armies were routed to a man and their lands ravaged. Afterwards, the Uesugi would easily topple the Ashikaga hold on the north of island and allow for amiable relations to begin in earnest between the Togoku and Korean cultures. The Korean colony of Njusore had been suffering financially for decades, and its latest governor vehemently blamed a coalition of the local tribes for fomenting widespread unrest amidst the native populations under his rule. In the past decade, significant resources had been spent to fight rebellions across the colonial lands. Emperor Yeongyang agreed that Korean rule of Putlagh should be cemented, and sent a full battalion of veteran regiments from the wars in China and Ilbon to bring the barbarous native populations to heel. The subsequent campaign took almost a year but crushed most of the native political structures. Those that remained wisely chose to recognize Korean rule and would be protected from rival foreign interests by the empire. Among the many things Se inherited from his father was an endless conflict with European colonialism in Indonesia. Initiated by his father's occupation of the Spanish colonies on Borneo, this conflagration caused bloodshed from the Indian Ocean to the Atlantic, but the worst combat was seen in colonial Qonti due to its proximity to major Spanish and French holdings. When it became clear that defending the colony against the European alliance would be impossible, Se commanded his generals to sacrifice their hold on the New World in order to strike at the Spanish homeland. With Sevilla and Granada pillaged, and Korean troops facing off with hastily mobilized Spanish and French forces in Toledo only a day's march from Madrid, the Spanish emperor saw fit to negotiate. Though the war incurred shameful costs, the Spanish were forced to hand over key ports across the New World and some of their control over coastal Borneo. Emperor Se only survived his father by eight years before following him into the afterlife, leaving an heir still quite young. His widow, the Empress-Regent Kim Jeongsuk, would prove to be a strong leader in his stead and devoted her rule to solidifying her son's rule over the Celestial Empire. Privy to her husband's war council and planning, Jeongsuk would decide to push forward his designs on China after his death. While Hanseong's control of northeast China was secure, the Korean Emperor's claim of divine mandate over China was elsewhere laughable. Though the Ming had been greatly disgraced by their abrupt fall from power, they were still widely regarded as the rightful rulers of the Chinese. To bolster and solidify the coming reign of her son, Jeongsuk, the Empress-Regent for young Emperor In, mobilized an invasion of south China to continue the expansion of Korean influence. Though costly, the Korean armies methodically pushed Ming forces further to the south annexing more of inland China and raising up another client state to better rule over the diverse local cultures. Though it was truly a puppet of the Korean emperor, the kingdom of Jiangxi would be formed from the provinces captured by the Korean army west and south of Zhejiang, allowing local rule in hopes of a compliant and peaceful populace. 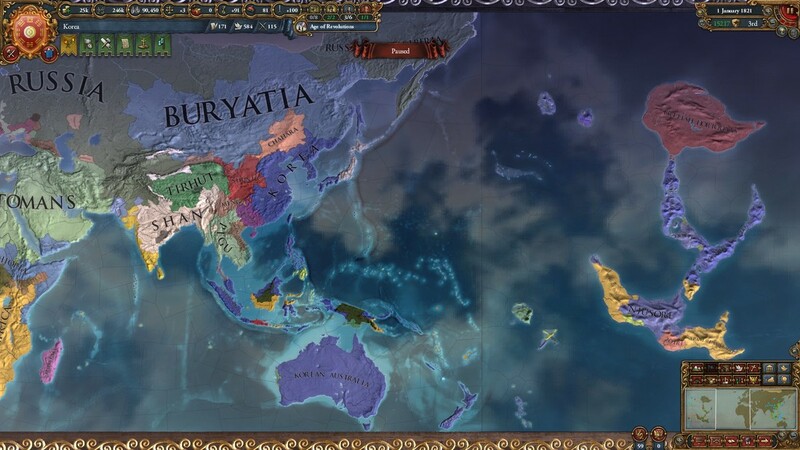 Buryatia was a loyal tributary to the Celestial Throne and Emperor Jeongwon was quick to push back against the Russian aggressors when the expansive border realm was invaded by the rival empire. After dozens of major engagements across the inhospitable mountains and forests of the frontier, the Korean generals struck at the heartland of the enemy, capturing St. Petersburg while the Russian armies were fighting rebellious Uzbecks far to the south. With the fight finally beaten from him, the Russian Emperor pulled back his armies and relinquished much of the sparsely populated borderlands to the Buriat ruler. While the belligerent nature of the Korchin had served their Korean overlords well in past era, their refusal to reform into an ordered Confucian society was now a frustrating liability that caused a drastic severing a diplomatic ties. In order to force reform upon the Mongols, Emperor Mun's armies swept away the Korchin warlords and disbanded their warriors with designs to create a new realm that would protect the northern Korean borders. Backed by the full support of Hanseong, a distant but favored cousin of the emperor was crowned prince of Chahara, and charged with governance of the Mongols and the vital defense of the northern routes. Though his advisers assured him that the Mandate of Heaven was secure, Emperor Mun choose to strike at his Ming rival with the assistance of the king of Shan. Now that the cultures and administrations of northern China had become further integrated into rule from Hanseong in the past decade, and the regional nobility was now less relied upon, Mun was confident that he could extend his rule to Xi'an and crush the last true power base of the Ming. With resources pouring in from his vast administration, the immense costs of men and gold for the invasion were hardly the strain on the Empire that might have been expected. Though the Ming emperor was able to resist Mun's term for years as he conducted a weak resistance in the rugged southern lands near Shan, he was eventually forced into capitulation. The Shaanxi region was officially turned over to the Celestial Throne, and became the core of the Shun kingdom with imperial sanction. Thanks to many lessons passed down from veterans of the first great war against the Russian Empire, Emperor Sinseong was able to turn the Russian offensive against Buryatia around much faster than his honored uncle had. Though the conflict was still a logistical nightmare with horrendous casualties, the chaos sown within the Russian heartland by the Korean armies caused a permanent withdrawal of Russian forces from much of Siberia and Uzbekistan, and fomented regional rebellions of those peoples repressed by the Russian Emperor for decades to come. The kingdom of Dai Viet was small but had long been part of Hanseong's tributary system and was able to call upon the soldiers of the Korean Empire when they were invaded by the king of Pegu. Battered from a long war with Russia, the Korean forces were unprepared for a war in south Asia, and it took many years to begin turning back the united offensive of Pegu and Shan. The empire's navy met with the earliest success in the protracted war, quickly clearing the enemy fleets from the southern seas once a campaign could be organized, and proceeded to blockade the Thai and Bengal harbors. The blockades would last almost four years, while their counterparts in the army stubbornly advanced from inland China, liberating Dong Kinh from enemy occupation before striking into the heart of Pegu's kingdom. At the bloody end, the kingdom of Dai Viet saw a significant amount of territory, lost from its rule for decades, restored. As had been taught to each Korean emperor before his ascension, the Ming would forever threaten the reign of the Yi until they bowed before the Dragon Throne. Sinseong's duty was clear to him, and when he felt responsibly prepared he dutifully ordered a new offensive against his rival claimant and their French allies. 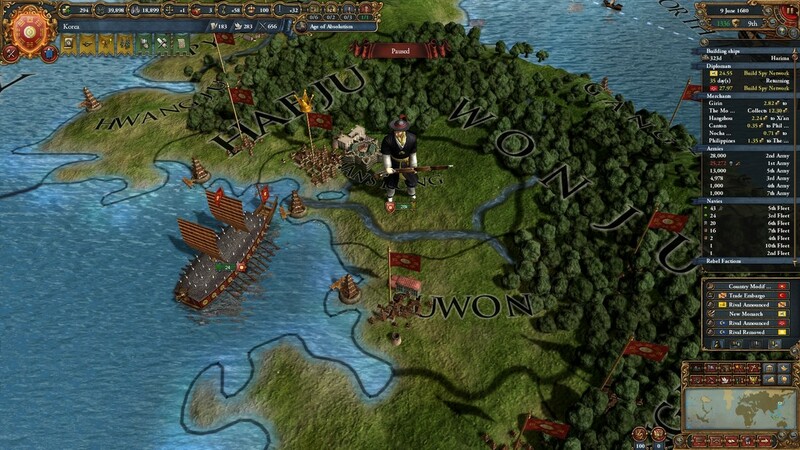 Though the French successfully raided Korean shipping and threatened pillaged their colonial holdings in Qonti, they were unable to prevent the utter defeat of the Ming armies in China. When Emperor Sinseong patronized a new king of Guangxi, the Ming were powerless to challenge his rule over the southern coast. Sinseong and his predecessors had long tolerated the open defiance of the Pattani. whose kings hindered Korean operations in Malaya with the backing of the Celestial Emperor's rivals in Shan and Pegu. When Korean diplomats finally succeeded in driving a wedge between Pattani and Shan, Sinseong sent his commanders to occupy Sumatra. The king of Pegu supported his ally in Pattani, and so half of the Korean army descended into the southern jungles from Guangxi, while the other half expelled the enemy from Sumatra's interior before advancing on the tenacious defenders of the capital city in the Malay Peninsula. At the war's conclusion, Sinseong's forces succeeded in removing all of Pattani's political structure in Sumatra and the southern Malay Peninsula, and the beaten realm of Pegu was forced return lands that had been wrongfully taken from the loyal tributary kingdoms of Dai Viet and Champa. The Ming dynasty had still ruled over a significant portion of rugged southwest China, but their continuous conflicts with Korea, Shan, and Pegu drove their subjects into a series of wide-scale revolts. These rebellions deposed the Ming monarchs and established the first Confucian democracy in their place. In an attempt to preserve their newfound authority and independence, the rebel leaders and administrators chose to adopt the prestige and legacy of the former dynasty by calling itself the Ming Republic. Within a few years of the revolution, however, their precarious position pushed them to accept membership in the Korean Empire's tributary system in exchange for political recognition and protection. 220 years after the last Korean ruler had paid tribute to a Ming emperor, the remnants of their dynasty were now subject to an empress seated in Hanseong. The Ming republic would prosper under the rule of Korea, and continuously serve as a reminder to the Celestial Emperor of the transitory favor of the Mandate of Heaven.